obstacle course, outdoor adventure, tree top adventure, zipline adventure, outdoor adventure park, aerial adventure park, zipline adventure park, corporate outings, activity park something that many or use lack enough time for in our modern lives. Thrill-seekers of all ages love climbing on ropes courses, but it can seem intimidating for first timers. In this blog, we put together some helpful tips to get you started on this thrilling adventure! Before heading to the adventure park, it is important that you make sure that you wear something comfortable. However, you will want to avoid clothing that is loose fitting. Additionally, you will want to steer clear of any clothing items with dangling strings or any other material that could catch or snag on something. Make sure to leave behind any accessories that may affect your ability to move. Instead of wearing sandals, opt for comfortable shoes, such as tennis shoes. Preparing your mind for the uncertainties of a rope course is no simple task. It is hard to predict how people will respond when confronted with the fear of heights or the fear of letting go. A rope course can be effective at helping someone conquer their fears by having them step outside of their comfort zone. Overcoming your mind, not your body, is the real challenge of this course. 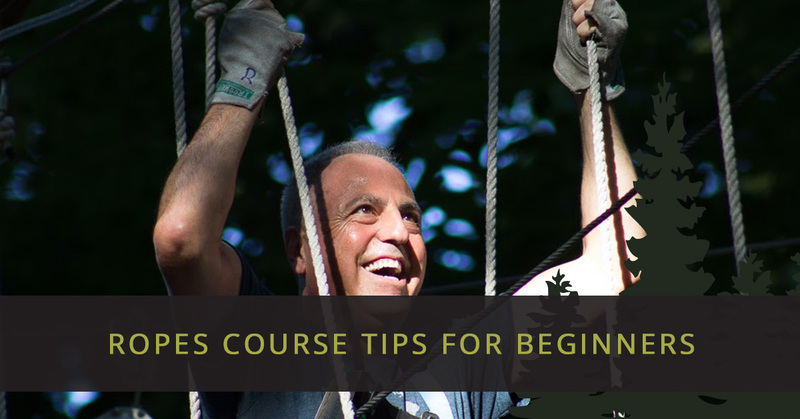 Many ropes courses occur in wooded areas while others happen in urban areas or in the desert. Outdoor ropes courses mean you are going to want something to keep those pesky mosquitoes and flies away. Nothing is more annoying than having to shoo away insects while climbing thirty feet in the air. Additionally, since the course is outdoors, it doesn’t hurt to wear sunscreen before going outside. High rope courses require some energy and physical activity — most of the time is spent moving around on your feet. Because you’ll be climbing and using different muscles than what you are used to, it is always a good idea to stretch and loosen up your muscles beforehand. Make sure to stretch your legs especially as these courses require a lot of climbing — many seasoned climbers will tell you that climbing is all in your legs! Remember, rope courses at aerial adventure parks are not a race — they are meant to test your skills and step outside of your comfort zones. More importantly, its an extremely fun activity. Everyone makes mistakes on these courses, so remember to make fun your number one priority when doing a rope course — you don’t want to climb down from a triumphant ropes course successfully only to realize that you earned a sunburn for your troubled efforts. A little preparation before your first rope course can go a long way. If you are interested in trying a ropes course near West Bloomfield, head to TreeRunner Adventure Parks.